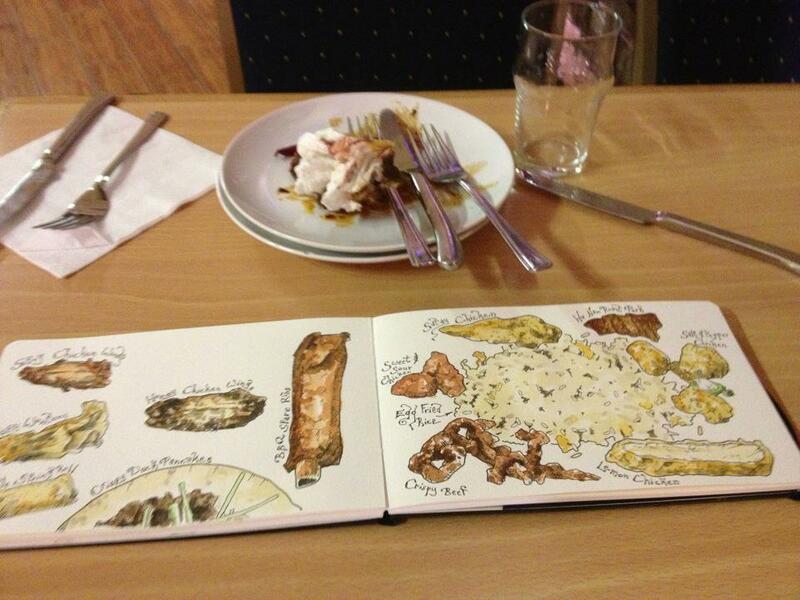 As part of Brighouse Arts Festival I’ve got twelve meals drawings on display at The Pot Spot. So, twelve meals at various restaurants and cafes in and around Brighouse. Well, actually they’re pretty much all in the centre of Brighouse. The Golden Sea restaurant is located on what, I suppose is, the main ring road round Brighouse. I was given and warm welcome and the food was delicious. (I really need to find a thesaurus to cook up some fresh adjectives. Caroline jokes that she can tell when I’ve enjoyed a meal out; if the waiter or waitress asks if we are enjoying our meal and I say that’s it’s delicious, then I am enjoying the food. If, however, I simple nod, or say that it is nice, then I am not.) This meal was delicious. And the portions were quite substantial too. I could have dined out on the Salt and Pepper Ribs alone; succulent ribs with a sprinkling of chilli. I’ve not had Popo Chicken before and it reminded me a little of sweet and sour chicken (which it was not), the sauce was mildly spicy and garlicky. The Special Fried Rice was packed with colour and tastes and again I could have quite easily picked that one dish as a meal on it’s own. I have to admit I had to ask for the remains of the Popo Chicken and the Special Fried rice to be boxed up and I enjoyed them all over again for my tea the following day. Caroline and I had a lovely meal out at The Canton Chef, at Honley, the other evening. As you can see I gave myself the evening off (Well, as far as I could!) … and drew the empty dishes as we finished each course.